Time gets away from all of us, March is almost over and we haven't updated you on our activities! 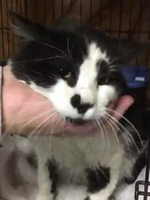 On 3/1, we sent one feral male to ADOPT for s/n. 3/2, we used the spay/neuter clinic at CatNap From The Heart for the first time. They have one vet, one tech who has other duties and can handle 10 or so cats a day. They were able to take our one female feral on short notice who had been trapped on Thursday. On 3/8, we sent 4 friendlies, 8 ferals, of which 8 were males and 4 were females to ADOPT. 3/9 - again, surprise cats were trapped on Thursday and CatNap came thru for us for 2 feral males. On 3/15 we sent 10 cats, 5 feral, 5 friendly of which 7 were female and 3 were male to PAWS. Among them was Sweetie - a kitten we received a call about from someone riding their bike in a park. They had no way to transport the cat, who, while extremely friendly, was definitely not up for a bike ride being held in someone's arms - thank you Cheri for zipping over to the park to get her! 11 ferals went to PAWS on 3/22, 8 females and 3 males. Among them was Fulton who hid the fact that he had a broken bone protruding from his rear leg. 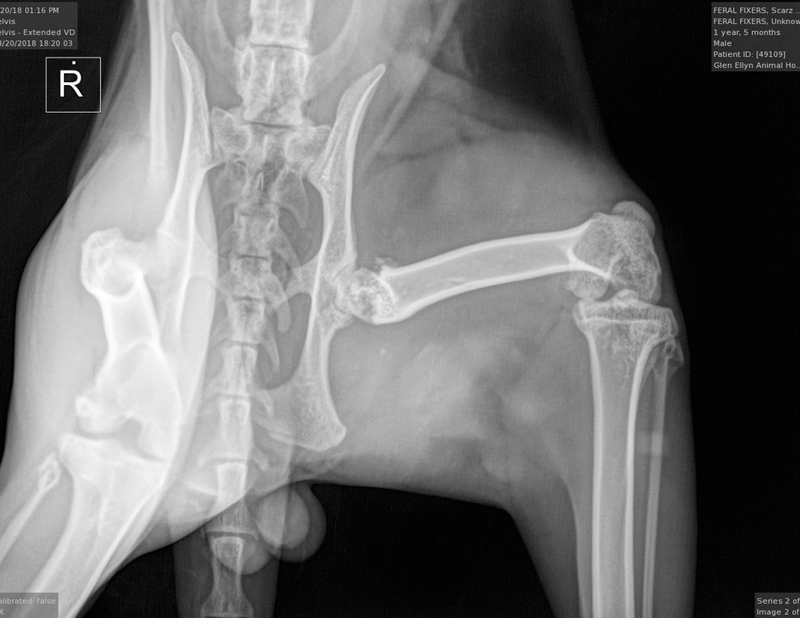 Ferals require much lengthier care for a leg amputation, they don't do well with a cone, medicating & care of the wound is extremely difficult and the infection was extensive so we opted for euthanasia. He came from a wooded area, other cats have had bird of prey injuries. 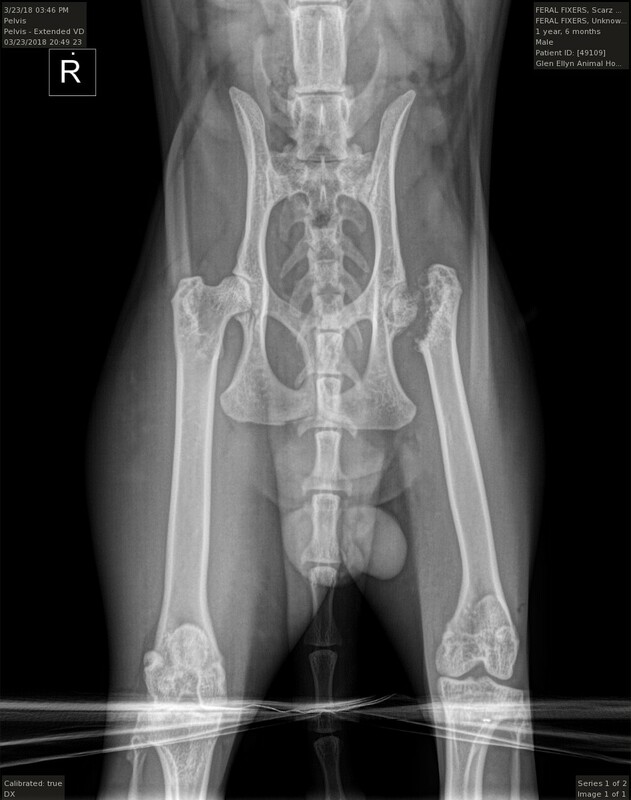 Last week on 3/23, Brady went to Glen Ellyn to have his femoral head removed - called an FHO. Thru accident, the head of his femur was severely damaged and popped from its hip socket. The procedure removes the head and the ligaments and muscles take up the support that the joint usually does. Brady had been living with this for some time, the supportive tissue was already doing a great job and he was so relieved to be out of pain post surgery!!! The xrays are before and day of surgery. He is already at ADOPT Pet Shelter to be fostered and put up for adoption when he is fully recovered. While ADOPT has their own vet on staff, they did not have all the equipment necessary for such a procedure. 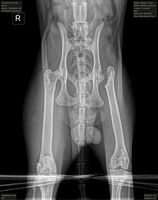 Brady was also neutered when he had the surgery. We are so glad to have Glen Ellyn Animal Hospital as a resource. One of our volunteers, Julie, is doing a facebook fundraiser for her birthday and is asking for donations to help cover his surgery along with our daily costs. Many thanks to Debbie, Charli, Dedra,, Laura, Linda & Mark for all of the transporting they have done for us to get these cats neutered! For March, so far we have neutered 37 cats, 67 for the year and 10,384 since our beginning in 2007! Right now we have 6 volunteers signed up for the Human Race on April 28th - you can run, you can walk, you can donate! You can go straight to the donation page for Feral Fixers - https://runsignup.com/Race/27820/Charity/5419 and help motivate our participants or become one yourself! Don't forget to pre-register for our Kitten Shower on April 22nd!